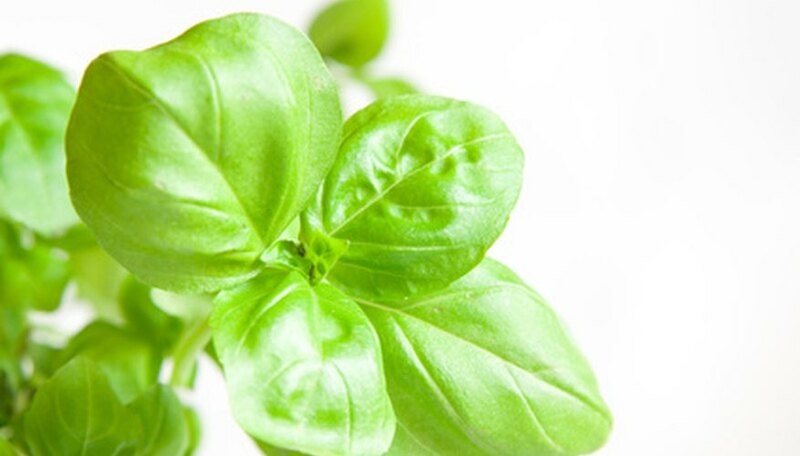 Sweet basil plants produce fragrant and flavorful leaves. Enjoy sweet basil leaves on sandwiches, in salads or as a seasoning. Cultivate sweet basil outside in the garden or inside in containers. Sweet basil thrives year-round if you grow it indoors, but it is an annual plant outdoors. Care needed to grow a sweet basil plant varies slightly between indoor and outdoor cultivation. Select an 8- to 12-inch diameter planter with good drainage. Fill the planter half-full with potting soil. Remove the sweet basil plant from its container. Loosen the dirt around the root base. Place the plant on top of the potting soil. Fill in around it with more potting soil, up to 1 inch from the rim of the pot. Place the sweet basil plant in direct sunlight or under grow lights for at least 8 hours a day. Water the sweet basil plants two to three times each week at soil level, avoiding the stems and the leaves. When flowers appear, pinch them away to direct the nutrients towards leaf growth. Pinching the flowers also helps sweet basil become more flavorful. Harvest sweet basil by picking out the top leaves and stems. Harvest leaves often to promote a healthy plant. Fertilize sweet basil with a small amount of nitrogen-rich fertilizer once each month. Plant sweet basil outdoors in a sunny location in the garden or in containers after the threat of frost has passed. Select soil or a container that drains well. Water the basil at soil level. If you live in a dry climate, frequent watering may be necessary. Sweet basil does not enjoy a dry climate. Harvest the basil often, always from the top. Pinch the flowers as they appear. Fertilizer sweet basil once each month during the growing season. Move sweet basil containers indoors before the first frost.